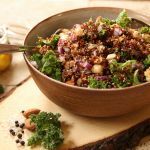 On today’s menu, we have a super easy, vegan red quinoa salad, that’s packed with flavor and crunch! 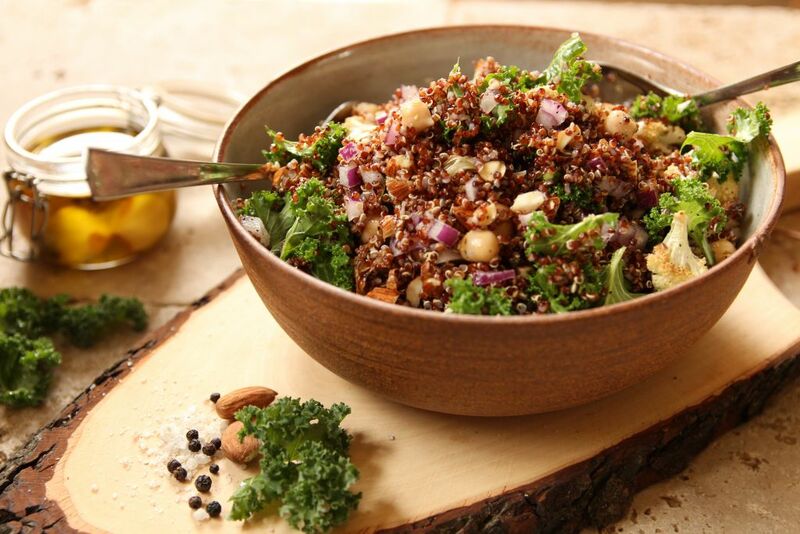 With roasted cauliflower florets, nutty almonds, and that good old healthy kale, this red quinoa salad is perfect for all those busy days, and worth every bite! Plus, the dressing couldn’t get any easier! I added a drizzle of my garlic infused olive oil, sea salt and black pepper to taste, and a squeeze of lemon! The result is a super fresh, and light salad, that tastes amazing! So, let’s brighten up our lunch, and get cooking! Place half a cup of uncooked quinoa in a pot, covered with plenty of water, and cook until soft, occasionally stirring. Cut the cauliflower into bite sized florets, and place onto a baking tray, lined with baking paper. Add sea salt and black pepper to taste, a drizzle of olive oil, mix, and pop it into the oven until golden brown, around 20 – 30 minutes. 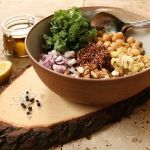 Finely slice the red onion and place it into a clean bowl, along with the cooked chickpeas. Next, roughly chop the almonds, tear the kale into small, bite sized pieces, and add them to the bowl. When the cauliflower florets are ready, take them out of the oven, and let them cool for a few minutes, then add them to the bowl, along with the cooked red quinoa, and a diced tomato. Finally, add a drizzle of my garlic infused olive oil, a squeeze of lemon, along with sea salt and pepper to taste, mix, and dig in! Want to whip up an easy sweet treat for later? 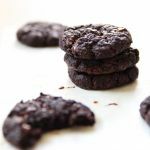 Try my Double Chocolate Chip Cookies! They’re gluten free, vegan, oil free, and taste phenomenal! Hi! I’m Elinor. Creator, Pastry Chef turned healthy, self-taught cook, and more! Welcome to my little corner of the net, Let’s Brighten Up. A healthy vegan food blog that’ll brighten up your eating experiences, views on food, and refined sugar free baking!